Tickets for the All-Star game go on sale tomorrow. 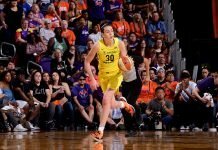 Breanna Stewart’s injury will have immediate impact on the WNBA and on CBA talks. Han Xu is ready to embark on her WNBA journey. Two Chinese players have turned down offers from the WNBA to train for military and Olympic games. Why does UConn lack depth? Jackie Young at Notre Dame: history, records and notable moments. The Irish will get North Carolina transfer Destinee Walker. Why it matters that the Lady Vols hired Kellie Harper. Harper is ready for the challenges. She has hired two assistant coaches.